Over the years of my graduate studies I made a lot of plots. I mean tonnes. To get an extremely conservative estimate I grep’ed for every instance of “plot\(” in all of the many R scripts I wrote over the past five years. B) Communication between you and someone else, through data. These two modes serve very different purposes and can require taking different approaches in their creation. Visualizations in the first mode need only be quick and dirty. You can often forget about all that nice axis labeling, optimal color contrast, and whiz-bang interactivity. As per my estimates above, this made up at the very least 10:1 of visuals created. The important thing is that, in this mode, you already have all of the context. You know what the variables are, you know what the colors, shapes, sizes, and layouts mean – after all, you just coded it. The beauty of this is that you can iterate on these plots very quickly. The conversation between you and the data can dialogue back and forth as you intrepidly explore and shine your light into all of it’s dark little corners. In the second mode, you are telling a story to someone else. Much more thought and care needs to be placed on ensuring that the whole story is being told with the visualization. It is all too easy to produce something that makes sense to you, but is completely unintelligible to your intended audience. I’ve learned the hard way that this kind of visual should always be test-driven by someone who, ideally, is a member of your intended audience. When you are as steeped in the data as you most likely are, your mind will fill in any missing pieces of the story – something your audience won’t do. In my new role as part of the Data Science team at Penn Medicine, I’ll be making more and more data visualizations in the second mode. A little less talking to myself with data, and a little more communicating with others through data. I’ll be sharing some of my experiences, tools, wins, and disasters here. Stay tuned! Editor’s note: This is a guest post by Marianne Corvellec from Plotly. This post is based on an interactive Notebook (click to view) she presented at the R User Conference on July 1st, 2014. Plotly is a platform for making, editing, and sharing graphs. If you are used to making plots with ggplot2, you can call ggplotly() to make your plots interactive, web-based, and collaborative. For example, see plot.ly/~ggplot2examples/211, shown below and in this Notebook. Notice the hover text! Go social! Like, share, comment, fork and edit plots… Export them, embed them in your website. Collaboration has never been so sweet! Not ready to publish? Set detailed permissions for who can view and who can edit your project. Baseball data is the best! 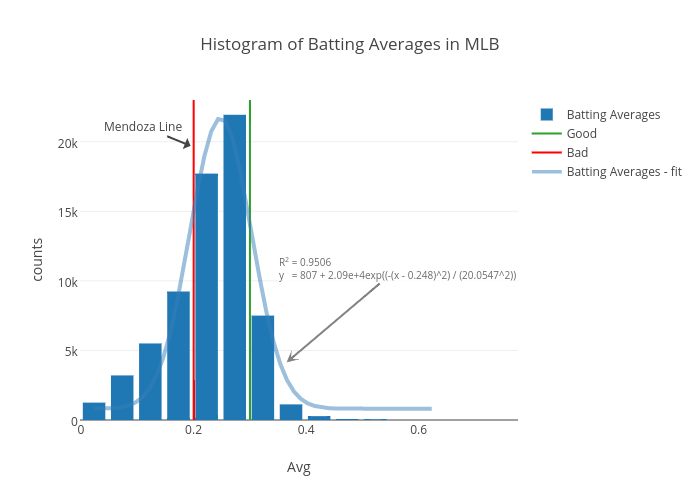 Let’s plot a histogram of batting averages. I downloaded data here. # Let's filter out entries where players were at bat less than 10 times. We have created a basic histogram; let us share it, so we can get input from others! Use your own credentials if you prefer. You can sign up for a Plotly account online. Your plot lives at this URL (`collab_hist$response$url`) alongside the data. How great is that?! You can give a title, edit the legend, add notes, etc. When you’re happy with the changes, click “Share” to get your plot’s URL. The JSON file specifies your plot completely (it contains all the data and layout info). You can view it as your plot’s DNA. The R file (https://plot.ly/~mkcor/305.r) is a conversion of this JSON into a nested list in R. So we can interact with it by programming in R! Send this new plot back to plot.ly! Visit the above URL (`enhanc_hist2$url`). How do you like this workflow? Let us know! This presentation benefited tremendously from comments by Matt Sundquist and Xavier Saint-Mleux. Plotly’s R API is part of rOpenSci. It is under active development; you can find it on GitHub. Your thoughts, issues, and pull requests are always welcome! Guest post by Matt Sundquist of plot.ly. Plotly is a social graphing and analytics platform. Plotly’s R library lets you make and share publication-quality graphs online. Your work belongs to you, you control privacy and sharing, and public use is free (like GitHub). We are in beta, and would love your feedback, thoughts, and advice. Let’s install Plotly. Our documentation has more details. Thanks for signing up to plotly! Your username is: MattSundquist Your temporary password is: pw. You use this to log into your plotly account at https://plot.ly/plot. Your API key is: “API_Key”. You use this to access your plotly account through the API. In our graph, the bubble size represents the city population size. Shown below is the GUI, where you can annotate, select colors, analyze and add data, style traces, place your legend, change fonts, and more. Editing from the GUI, we make a styled version. You can zoom in and hover on the points to find out about the cities. Want to make one for another country? We’d love to see it. Ben Chartoff’s graph shows the correlation between a bimodal eruption time and a bimodal distribution of eruption length. The key series are: a histogram scale of probability, Eruption Time scale in minutes, and a scatterplot showing points within each bin on the x axis. The graph was made with this gist. Suppose you are studying correlations in two series (Popular Stack Overflow ?). You want to find overlap. You can plot two histograms together, one for each series. The overlapping sections are the darker orange, automatically rendered if you set barmode to ‘overlay’. # style background color. You can set the alpha by adding an a.
Plotting two lines or graph types in Plotly is straightforward. Here we show y1 and y2 together (Popular SO ?). # format, listing y1 as your y. # format again, listing y2 as your y. And a shot of the Plotly gallery, as seen at the Montreal meetup. Happy plotting!